Absquatulate: To take leave, to disappear. I’m so sorry about that short hiatus, things have been so crazy. I’ve been dealing with several international bureaucracies, and I don’t even really have a moment right now. Hopefully, I’ll get back on a stable schedule and be able to post more regularly. In the mean time, I’m going to do a series of posts about Getting to Know the 1800s, taking excerpts from Everyday Life in the 1800s by Marc McCutcheon. Perhaps it will entertain some of you, especially those of you who enjoyed the Olde Timey Insults! Funny what quaint slang they had back then, isn’t it? “An Albany or Newark dog is well worth fifty cents, if brought to Gotham’s authorities, as if actually killed in Gotham’s streets… We understand that a dog’s flesh is quite a luxury in Gotham market.” Philadelphia Public Ledger, 5 August 1836. Pigs: Kept as pets and as future food sources in yards, towns, and cities all over America. Thousands of them ran freely on New York City streets during the first half of the century. Queen Anne House: A house style popular in the 1870s and 1880s in England and America, actually based on a combination of Elizabethan, Tudor, Gothic, and English Renaissance forms. Notable features included polygonal or cylindrical towers, bay windows, balconies, and ornate woodwork. 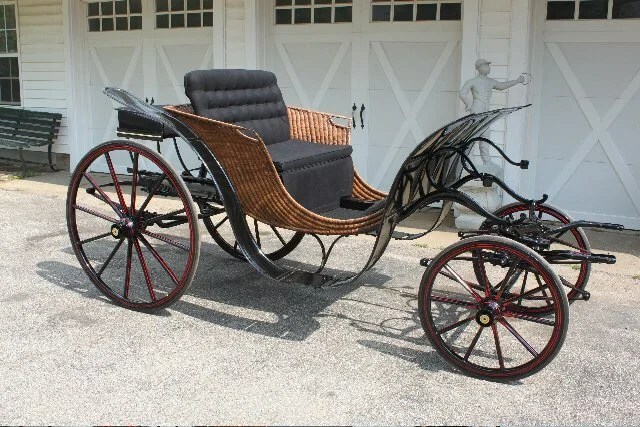 Groom’s Seat: A small seat or rumble seat where a groom or footman rode at the back of a coach or carraige. Dugway: Popular slang for a simple, dug-out road. George IV Phaeton: An elegant, slipper-shaped carriage with folding hood, pulled by two horses. This vehicle was very popular with women because it was graceful and was open to allow the passengers’ fashion to be seen and admired from the street.